Welcoming 4 bedroom holiday home to sleep 10. Ideally located near Ajaccio, Corsica. This holiday villa offers a brilliant private pool to relax, play and soak up the sun! You’ll be staying only a short walk or drive away from the beach. Air conditioning. On site parking. Airport within 1 hour. Pets not accepted. 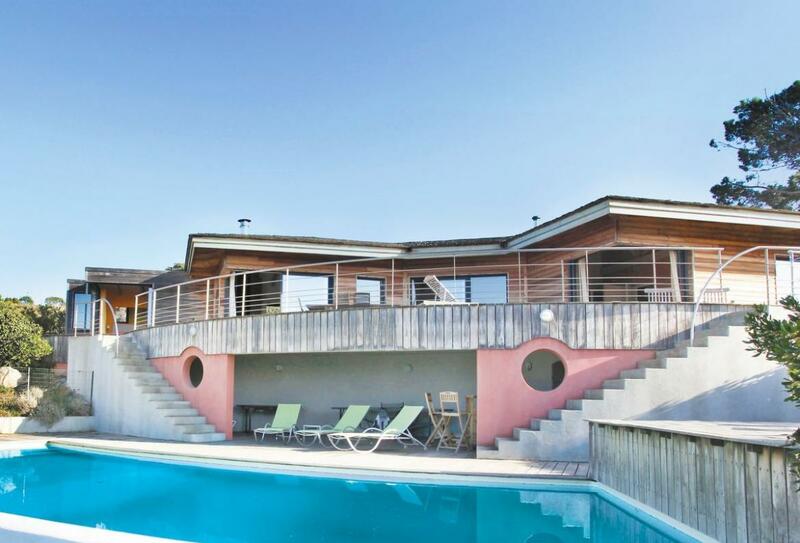 This magnificent, wooden house, with air conditioning, is near to the village of Acqua Doria in the south of the Gulf of Ajaccio, and is built on a very large private plot of land in the Corsican countryside. The swimming pool, pool house (with shower and toilet) and Jacuzzi (for seven guests) allow you to relax in this veritable haven of peace. From the vast decked terrace, you will be able to admire the panoramic view over the Gulf of Ajaccio and the Sanguinaires islands whilst admiring the beautiful evening sunset. In the surrounding area, fine sandy beaches and a crystal clear sea waits, with the beach of Cala d’Orzu or that of Coti-Chiavari, which is also called the silver beach, where numerous watersport activities can be enjoyed. You can discover the beauty of the Corsican landscapes with beaches and coves, facing rocky mountains covered in undergrowth, all of which are covered with Genoise towers which serve as a reminder of the history of Corsica as does the Unesco classified prehistoric site of Filitosa. NB: Open-sided steps to pool area. Location: 1.6km from shop and restaurant, 3.5km from beach, 41km from Ajaccio (shops, restaurants, museums, cathedral), 55km from Propriano (harbour, restaurants, cafés).